What is a viable solution for our country’s corroded steel pipeline infrastructure? Find answers in this guide on how to produce a practical solution for rehabilitating existing steel pipeline in a reasonable timeframe and budget. How Does the Steel Pipeline Rehabilitation Process Work? What are the costs & consequences of our steel pipelines? 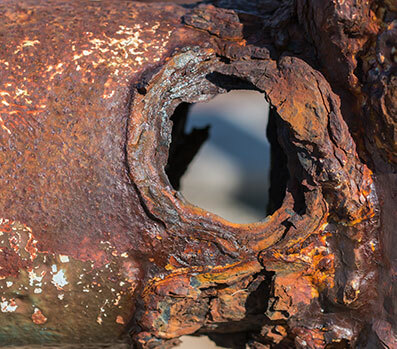 Understand the industry’s past efforts to stop steel pipeline corrosion. It’s clear that a new solution is needed. What are some of the possible solutions and new technologies available to rehabilitate the steel pipeline infrastructure rather than replace it? See how it’s been done in real-life situations around the globe. With decades-old steel pipeline running throughout the country, we are at risk of suffering from a failure that will impact our environment, our property and our health. Much has been written about the nation’s aging infrastructure—infrastructure is as susceptible to physics as anything else. However, with specific regard to the 2.5 million miles of America’s steel pipeline infrastructure, let’s be blunt: it’s old. According to the U.S. Department of the Interior, over half of these pipelines are at least 50 years old. More than 12 percent of U.S. cross-country gas transmission and hazardous-liquid pipelines were built before 1950. Some predate World War II. These pipeline networks carry all of our nation’s natural gas, most of its petroleum and crude products, and a variety of hazardous liquids that include anhydrous ammonia and carbon dioxide. They are found onshore and offshore, in rural and urban areas, transporting commodities between producers, refiners, processors, terminals, distributors, and end users. The pipelines run near schools, homes, and environmentally sensitive areas such as water supplies. Most of these steel pipes are made from low-carbon steel, a strong and moderately flexible material that is, unfortunately, highly susceptible to corrosion. Years of exposure have taken a brutal toll. Of course, there are the highly publicized events, such as the 2010 Michigan pipeline rupture in which more than 840,000 gallons of crude oil spilled into the Kalamazoo River—with a cleanup bill of $800 million, the costliest in U.S. history. Then there’s the more recent Belle Fourche pipeline incident, where 176,000 gallons of crude leaked into the Ash Coulee Creek just 150 miles from the Dakota Access protest camps.4 In reality, these spills happen all the time and, as old pipelines get even older, with increasing frequency. Since 2010, there have been 1,300 oil spills from U.S. pipelines. That amounts to nearly 9 million gallons — one spill every 2 days. In addition to the environmental consequences and potential loss of human life, these incidents can result in shortages and price spikes. While every subsequent incident gives the industry another black eye, pipelines still provide the safest and most cost-effective means for transporting oil and gas, particularly when you factor in an amount of production projected to reach 27 million barrels a day by 2020. In other words, the infrastructure works. It’s just not getting any younger. So What Can Be Done About Aging Steel Pipelines? According to a 2015 report by the Department of Energy, replacing all of the nation’s oldest and most vulnerable pipelines would cost $270 billion. A far more cost-effective solution is pipeline rehabilitation, also commonly referred to as remediation or reline. Developed by Polyflow, this technology allows a flexible, thermoplastic pipe to be pulled through existing pipeline infrastructure, dramatically reducing the material and labor costs. When most of us hear the word “steel” we think of strength. We think of the “man of steel.” A determined individual will have a “steel” resolve. We tend to overlook the fact that this material has a tragic weakness, an Achilles Heel. Slowly but inevitably, it’s disappearing. As stated in Chapter 1, there are 2.5 million miles of steel pipeline in the United States. They carry everything from natural gas and crude products to petroleum and hazardous liquids like anhydrous ammonia and carbon dioxide. And all of them are highly susceptible to corrosion and erosion. cast iron, a material that is extremely corrosion-resistant. However, cast iron has low beam strength, making it vulnerable to stress due to freezing, erosion, excavation, and other underground disturbances. (Source) Steel’s flexibility and ease of fabrication made it the material of choice in the twentieth century. Unfortunately, the leading cause of releases on gas transmission and hazardous liquid pipelines is corrosion, which is directly affected by how long these lines have been in the ground. In a study conducted from 2008- 2016, corrosion was a factor in 24 percent of significant incidents. Every year, we spend $7 billion to monitor and maintain all of these pipelines. Roughly 80 percent of those costs are corrosion-related. Pipeline design has evolved over time. Notably, some standards have proven to be more effective than others. Just because a pipeline is newer doesn’t necessarily mean it’s safer. For example, cathodic-protection systems implemented in the late 1940s helped to mitigate oxidation damage from external corrosion. On the other hand, other protection methods had good intentions that failed upon execution. 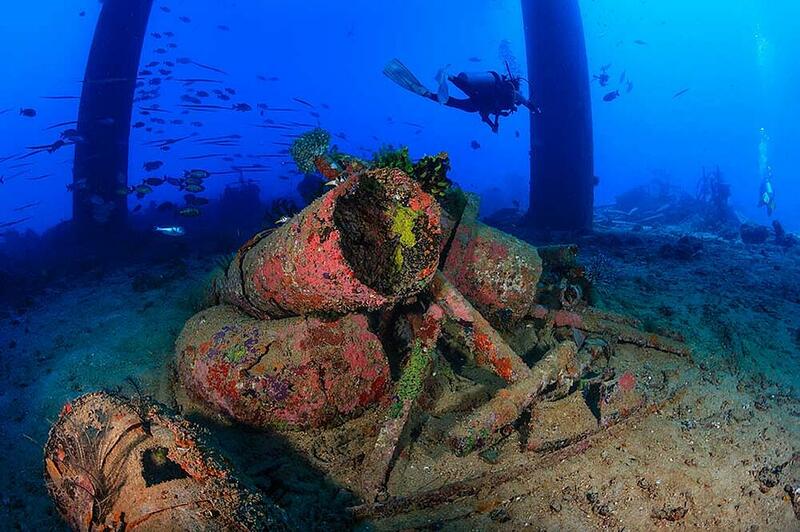 Early anti-corrosion pipe coatings have been shown to be worse than having no coatings at all. 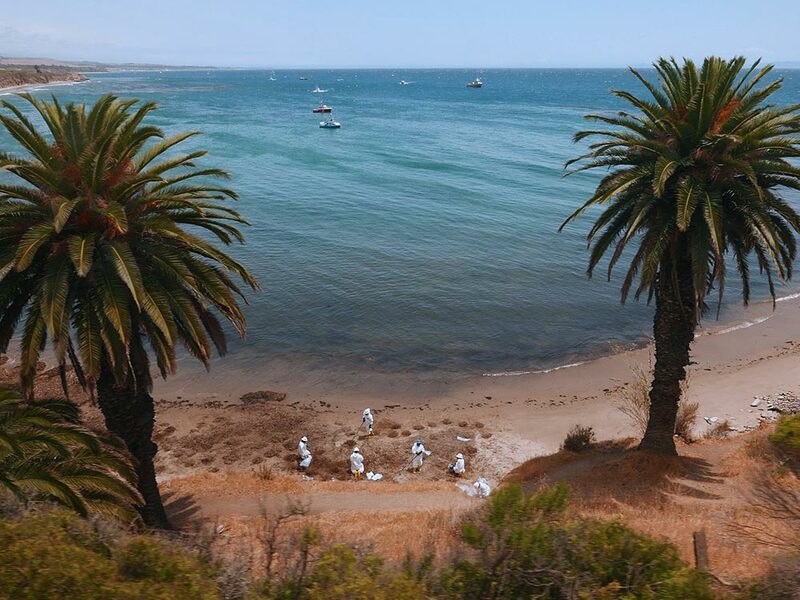 A May 2015 crude oil spill that affected California’s Santa Barbara coastline was due to a corroded section of pipe that was only 28 years old. While maintenance, testing, and inspection practices have evolved, they differ from one operator to the next, adding yet another variable to the mix. 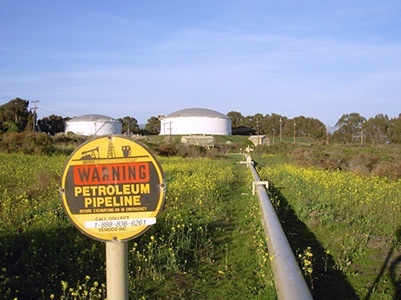 One source of external corrosion involves the environment surrounding the pipeline. Stress corrosion cracking (SCC) can result from a combination of the external corrosive environment, pipeline composition, and tensile stress of the pipeline. Stress corrosion cracking can be identified by the appearance of patches of parallel cracks on the external surface of the pipe, usually in the direction of the pipe. Generally, there are four environmental conditions that can create a corrosive environment for a steel pipeline. 1. The ability of a pipeline coating to effectively bond with the steel can determine how well the pipe can resist the moistures and temperature variations of the surrounding soil. 2. The soil itself can be a factor. Drainage properties, composition, even electrical conductivity can determine the likelihood of stress corrosion cracking. 3. The presence of cathodic protection can determine the presence of a carbonate/bicarbonate environment at the surface of the pipeline where high-pH stress corrosion cracking can occur. 4. The temperature of the soil can result in high-pH stress corrosion cracking. Finally, there’s the tensile stress, defined as the load per unit area within the pipe wall. This stress can come from a number of sources, including the movement of the soil surrounding the pipe, but it is primarily driven by the internal pressure. How the pipe was welded can create what is referred to as residual stress. When these factors converge—environment, composition, and stress—stress corrosion cracking will occur. The pH level at the surface of the pipe and temperature can also exacerbate the likelihood of stress corrosion cracking. Initially, small cracks will develop on the exterior surface of the steel pipeline—thus the name. Over time, these cracks will cluster, creating longer cracks. Usually, this process takes many years. While pipe failure as a result of stress corrosion cracking is relatively rare, when it does happen it can be both costly and destructive. the temperature, pressure and flow rates of the materials being transported. 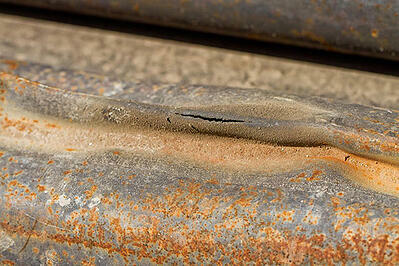 Uniform pipe corrosion results in a uniform loss of material on the surface of the pipe. Pitting is a more localized form on the surface to material defects or chemical degradation. Selective leaching occurs when a noble metal and a more reactant element form an alloy, which may result in loss of the reactive element. Galvanic corrosion happens when dissimilar alloys or metals are connected electrically. Crevice corrosion occurs in areas where there is a lack of oxygen, which can accelerate certain reactions. Cavitation can occur when a fluid’s vapor pressure exceeds its working pressure, causing vapor pockets to form and collapse at the pipeline’s surface. Stray current corrosion is the result of stray electrical currents from overhead and buried lines or other electrical sources. The chemical composition of materials flowing inside the steel pipeline is a huge factor in the pipeline’s corrosion. In particular, carbon dioxide (CO2), hydrogen sulfide (H2S), and free water can cause major damage to steel infrastructure. From pipelines to processing equipment, hydrogen sulfide (H2S) wreaks havoc on oil and gas infrastructure. This corrosive compound, commonly called sour gas, is found in the highly acidic hydrocarbons ubiquitous to crude oil and refinery operations. In this destructive process, carbon steel becomes brittle due to contact with the H2S, the resulting oxidation reaction, and the loss of electrons. Wet H2S cracking is a particularly dangerous form of corrosion in that it occurs on the interior of vessels, where detection is difficult and often comes too late. In these liquid process environments, atomic hydrogen from corrosive reactions enter and weaken the steel structural integrity. This can occur in conditions above 50 ppm of H2S and below 180°F. Different types of H2S cracking include Hydrogen Induced Cracking (HIC), Stress-Oriented Hydrogen Induced Cracking (SOHIC), and Sulfide Stress Cracking (SSC). H2S leaks are a huge safety concern in the industry. Not only is the colorless gas toxic, the corrosion can result in spills that bring production to a halt and require costly cleanup and equipment repairs. Many of these chemicals are present in the formation, but often they are introduced to the production fluids. For example, to increase the output of a well, operators will often inject CO2 or seawater into a formation. These corrosives, along with the high temperatures characteristic of extracted crude, dramatically exacerbate the problem. Once these contaminants begin to collect in a pipeline, they eat away at the interior steel surface. This in turn attracts other particles, creating additional fluid turbulence and accelerating the process of corrosion. In 2008, after a major spill in Prudhoe Bay, Alaska, one operator discovered portions of pipeline that had lost more than 70 percent of its mass to corrosion. 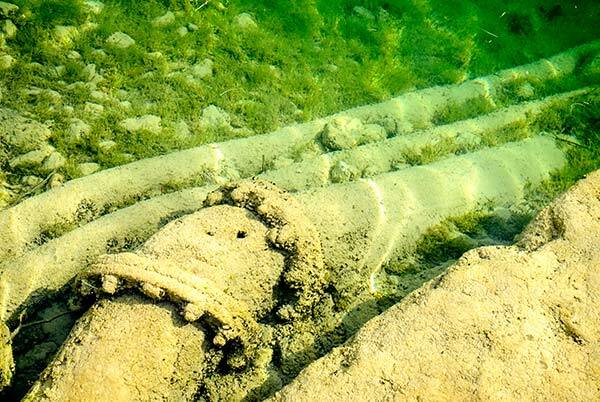 Corrosion, as a result of the erosive particles such as sand and byproducts, is another factor in the degradation of steel pipelines. Fluid velocity, intensified by the high temperatures and pressures, will inevitably wear down the mass of the pipe. Microscopically, steel is not a relatively smooth surface. Once these turbulent fluids find these crevices and imperfections, pitting and cavitation have a cumulative effect. Curves and turns are prime locations for this to occur. Eventually, the pipe will erode and no longer hold its pressure. All of the factors above are further compounded by the fact that over time, the production parameters may have changed. Pipelines, particularly in the case of oil and gas production and gathering lines, are frequently repurposed to carry different products and materials. Introducing unconventional production may result in more acidic hydrocarbons. Specifications made for the original pipeline may no longer be adequate. 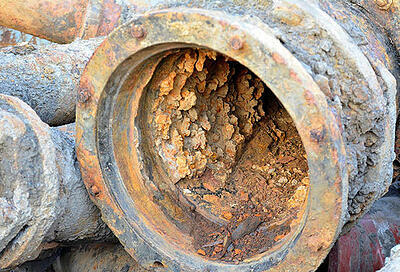 What can be done about our corroding steel pipeline system? Composite wraps, in which resin-impregnated fiberglass is wrapped several times around the leak, eliminates the risk of explosions because no welding or cutting is required. In an industry comparison, composite repair systems were an average of 73 percent less expensive than replacing the damaged section of pipe and 24 percent less expensive than welded steel-sleeve repairs. (Source) While the process is relatively fast, the long-term effectiveness of this solution is still under evaluation. There are also methods of leak or crack detection, such as Wet Fluorescent Magnetic Particle (WFMP) Inspection and Phased Array Ultrasonic Testing (PAUT), but these de facto solutions are often expensive and tend to work better in the lab than in the real world. However, identification is merely an additional cost to the basic problem operators still have to solve. We’ve tried a lot of things over the years to slow corrosion, each with limitations. Is there a better solution that is also cost-effective? What’s the solution for updating our country’s aging steel pipelines? Brine, bacteria, CO2, H2S and other corrosives have taken a costly toll on aging oil and gas transport infrastructure. With each passing day, risks grow—economically and environmentally. As mentioned in Chapter 2, a single incident can cost millions to clean up and there have been 1,300 spills in the U.S. from steel pipelines since 2010. Most existing pipelines are made from low-carbon steel, and have been since the late 1960s. There’s a reason: steel is strong, moderately flexible, and easy to fabricate. Unfortunately, it’s also highly susceptible to internal and external corrosion. It seems that it’s time to find alternatives to steel pipelines that can sustain the wear and tear and other environmental factors that make sustaining the infrastructure such a difficult task. Replacing existing steel with steel outright is a costly enterprise. According to a 2015 report by the Department of Energy, replacing all of the nation’s oldest and most vulnerable pipelines would cost $270 billion. Even when replacement is an option, one must consider managing supply disruption and alternate routes. In urban areas, replacing pipelines means tearing up roads and removing existing utility lines for telephone, electricity, water, or cable services. Municipal permitting is also required. As if these obstacles aren’t enough, many pipelines are owned by corporations or public utilities. Because these entities may lack the authority to pass significant expenses on to customers, they may be reluctant to take action. High-density polyethylene (HDPE) piping is an affordable alternative to steel pipe, but lacks high-pressure capabilities. It also offers little protection against the corrosion ubiquitous with hydrocarbons. Increasingly, companies are turning to low-cost pipeline rehabilitation, and are looking for solutions that can fill the void between steel and HDPE. Spoolable, composite pipe is such a solution—and it’s filling the void perfectly, as many upstream and midstream companies are discovering. It brings all of the advantages of steel without the cumbersome and costly drawbacks. Thermoflex® pipe is a lightweight, spoolable product manufactured and supported by Polyflow. With a patented layering system comprised of aramid fibers for strength, the material offers higher pressure capabilities than HDPE—up to 2,000 psi—depending on the diameter, and features a nylon lining for corrosion protection. It’s flexible, fast and easy to install, and requires no heavy machinery or welding. Due to the product’s low-friction coefficient, Thermoflex can achieve flow rates comparable to those of much larger-diameter pipes. Its higher pressure and temperature rating, along with low permeability characteristics, make it ideal for pipeline rehabilitation. In this process, developed by Polyflow, a pig is run through an existing steel pipeline while pulling a rope, which is then used to pull a section of Thermoflex pipe back through the existing pipeline. Because it’s a lightweight material, the process doesn’t require a lot of pulling force, taking usually just a few hours per mile. Costs for both initial installation and long-term maintenance are dramatically reduced, improving operational economics when companies need it most. This process, referred to as Enhanced Rehabilitation Technologies®, eliminates the expense of excavation and trenching and minimizes pipeline disruption. 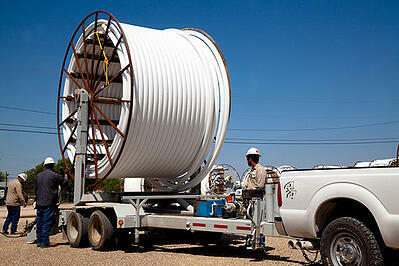 Deployment package includes Thermoflex pipe, trailer, fittings, inspections and warranty. Process managed by in-house applications engineers and field service technicians. 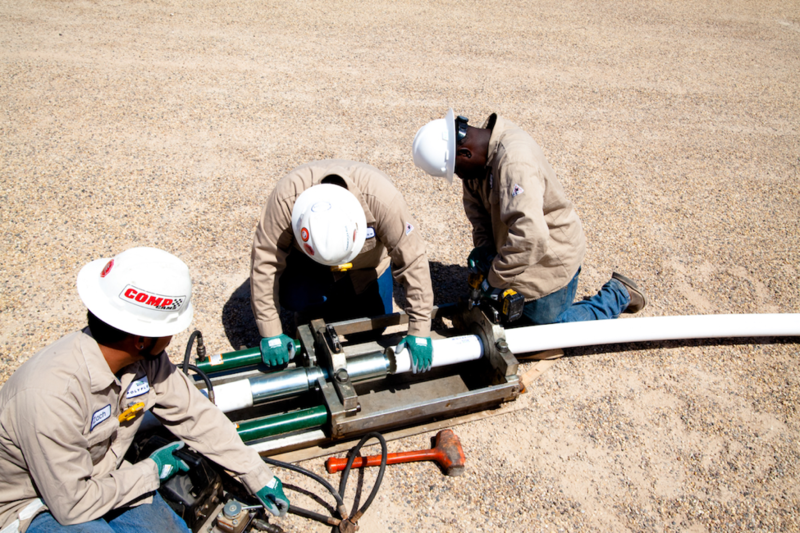 Installation can be handled by certified field service technicians, or Polyflow will train and certify your crew. Customized trailer provides automated spooling for faster, easier and safer deployment—with less manpower. Already, there have been numerous examples demonstrating the value of this technology to the upstream and midstream industry. Spoolable, composite pipe has become an alternative without compromise or downside. It offers reduced cost, quick and easy installation, and corrosion resistance all rolled up in a convenient pipe-rehabilitation solution. Thermoflex not only works on land, but underwater too. Case study: A production company operating in the Gulf of Mexico was experiencing multiple leaks in an existing 14,000-ft. line comprised of 4-inch, 6-inch, and 8-inch steel pipe connecting an offshore platform to an onshore facility. 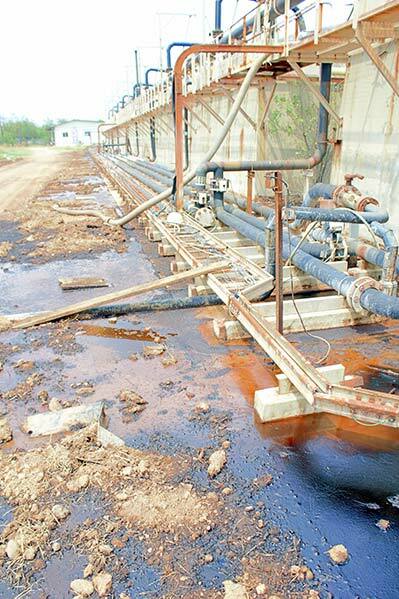 Because the line carried oil, brine, and gas, a corrosion-resistant material was needed. A Thermoflex pipe was pulled through the existing pipeline, which was flooded with seawater, reducing the required pulling force by 90 percent. In just three hours, a winch truck on the platform pulled through 9,000 feet of Thermoflex. A second spool was attached using a leak-free splice coupling. The new, corrosion-resistant line was successfully hydrotested at 750 psi—1.5 times the maximum operating pressure. Oil and gas companies operating on land in the US, particularly in South Texas, the Rockies, and the Permian Basin, as well as other similar environments internationally need pipelines that can handle their high-pressure, high-temperature operations. For them, Thermoflex provides an attractive alternative to steel. Due to its unique manufacturing process, Polyflow can customize this Reinforced Thermoplastic Pipe (RTP) solution to the application. Featuring five proprietary layers of reinforcement, Thermoflex goes beyond conventional pipe solutions. Compared to steel, it offers up to four times the corrosion resistance and eliminates the need for chemical washes, rust inhibitors, anodes, cathodes, or DOT-regulated inspections. Beginning with inner layers of Nylon PA12 or Polyphenylene Sulfide (PPS), Thermoflex is ideal for an assortment of extreme conditions, aggressive chemicals, corrosion, oxidation, and certain hydrocarbons. While high-density polyethylene (HDPE) is four times as resistant than regular steel pipe, PPS and Nylon are two to three times more resistant than HDPE. Wrapped around the Tybond layer is the center layer, which provides Thermoflex with the ability to withstand temperatures of up to 180°F. The fourth layer consists of Kevlar® aramid fibers, which provide lightweight reinforcement accommodating cyclical loading and surge pressures. Unlike braided polyester, it doesn’t exhibit problems with creep. Depending on the pipe diameter, the aramid allows the pipe to handle maximum operating pressures of up to 2,000 psi, with the braiding process determining specific rating. The fifth and final HDPE layer provides abrasion resistance and maintains the integrity of the inner layers. Thermoflex RT, for raised temperature applications, offers excellent permeation resistance to H2S, CO2, and CH4 and reduces H2S partial pressure on existing steel pipe by 90 percent. By reducing CO2 partial pressure, it increases pH in the annulus, protecting aged hosting pipe and reducing the risk of a future breach. Thermoflex by Polyflow has proven itself a highly capable alternative to steel for the rehabilitation of aging pipelines. It can easily handle high-temperature, high-pressure requirements of oil and gas applications. Combined with its the pull-through technique, it provides operators with an economically compelling solution to the problem of aging infrastructure. Find out how you can implement a steel pipeline rehabilitation that’s easy-to-install and cost effective. Developed by Polyflow, Thermoflex, and Thermoflex Plus, and Thermoflex RT spoolable RTP has become an attractive, cost-effective alternative to carbon-steel pipelines. These lightweight pipe products have proven to be highly resistant to corrosion and erosion, offering low flow resistance and ultralow permeation to H2S, CO2, CH4, and water vapor. With a unique, five-layer design, these products can accommodate pressures of up to 2,000 psi and temperatures of up to 180° F, making them ideal for oil and gas applications—and not just for new installations. With its low-friction coefficient, Thermoflex can achieve flow rates of larger-diameter steel pipe. As a result, it’s increasingly being used for pipeline rehabilitation, using a process in which the composite pipe is pulled through existing pipeline infrastructure. This eliminates the expense of excavation and trenching, minimizing disruption. Polyflow makes deployment and installation easy, providing comprehensive consultative and engineering support that spans from manufacturing through testing. Next, the site is assessed, noting any potential installation issues, incline and terrain, soil conditions, rights of way, and depth of burial required all help determine the proper implementation approach. Our team then validates the system design and configuration. Once the product has been determined, Thermoflex pipe is loaded onto reels and trailers for safe transport to the site, along with all required tools and installation equipment. Polyflow technicians will then be on hand for unspooling for direct-bury installation, surface installation, or in the case of rehabilitation projects, a pull-through installation. As outlined earlier in Chapter 3, Polyflow will run pigs through existing pipeline via excavated access points, making make sure there are no obstructions. Connected to the pig is a nylon rope, which is then attached to Thermoflex pipe. The new pipe is pulled back through the steel pipeline in a process that usually takes no more than a few hours per mile—much faster than digging up and replacing existing steel. This translates to some very impressive labor savings. Thermoflex metallic couplings and termination connections are easily made using a portable swaging machine and an electric or hand-operated hydraulic pump—no welding or makeup required. Coupling options include zinc-chromate carbon steel, 316 stainless steel or Duplex 2205 Stainless for sour environments. For more extreme applications, custom-made exotic alloys are also available. Before operation, Polyflow technicians will supervise hydrostatic testing with a certified third-party contractor at 1.25 times (or greater) maximum operating pressure for eight hours. Thermoflex is quickly deployed with minimal manpower, reducing both capex and installation costs. Even better, this solution continues to lower operational costs and boost efficiency, making an increasingly compelling economic case. Operators should always look to lower operating costs while increasing productivity. Compared to steel, Thermoflex delivers in a number of ways. Thermoflex is considered smooth-bore pipe. New carbon steel typically has a roughness of approximately .003 inches. Thermoflex has a roughness of .00006 inches. With a lower coefficient of friction, operators can use the smaller-diameter RTP pipe for the same applications. Not only do you need less of it, it’s lighter to begin with. Depending on the material, composites can be up to 70 percent lighter than steel. Also, because of its flexibility, Thermoflex can be customized for strength in critical areas. With steel, greater strength requires more metal, more weight. One section of Thermoflex can replace numerous metal parts, simplifying not only installation but reducing the amount of ongoing maintenance required. This reduces transport and equipment costs while simplifying installation and labor. Smaller pipe is less intrusive and cumbersome. Thermoflex is also easy to bend and manipulate. And of course, unlike steel, it never rusts and requires no corrosion inhibitors. Thermoflex, like other composites, are resistant to external corrosion as well, which means zinc coatings are not required. Thermoflex is also non-conductive, which means its not influenced by electrical fields or currents. Cathodic protection is unnecessary. These benefits have made this an attractive option not only for pipeline rehabilitation, but for new installations and oil and gas gathering lines as well. A Polyflow customer operating in the Marcellus needed 12,800 feet of new gathering lines installed on numerous gas wells. Generally, the lines would operate under 500 psi, but as more wells were added, it could creep up to 1,000 psi. Expected flow rates would be 300-3,000 MCF/day. 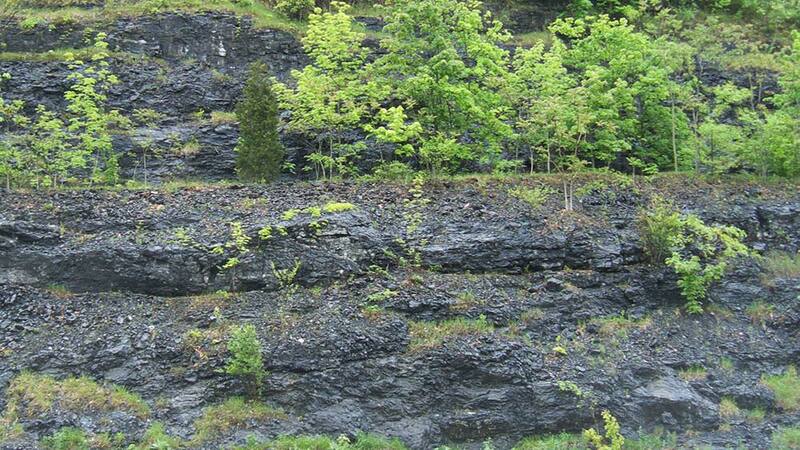 Tie-in lengths ranged from approximately 1,000-4,000 feet. The trench, along with the installation of the 3,500-foot trench line was installed on the first day. The individual wells were trenched, backfilled, and tied-in at a rate of one per day. While the customer’s safety procedures required welded connections, the length of the Thermoflex pipe reduced the number of connections, saving time and money. Ultimately, ditching costs dropped from $7/foot to $2/foot. Gathering line pipe costs dropped from $2.95/foot to $2/foot. The job required a smaller, three-person crew and the welder’s time went from four days down to a half-day, with no cathodic protection required. All in all, it added up to $76,000 saved in installation. In short, Thermoflex helps reduce costs across the entire lifecycle of the pipeline, delivering substantial savings advantages over steel, meeting the higher pressure and temperature requirements for many of these applications. It can be customized to specifications during manufacturing. It’s lightweight and spoolable, reducing shipping costs and labor required for deployment. It eliminates the need to completely excavate and replace existing pipeline for rehabilitation projects. And because it’s corrosion resistant, there’s no longer a need for expensive coatings or additives. Polyflow continues to advance these cost-effective innovations, recently releasing a new product called Thermoflex® ECO. Featuring three composite layers instead of five, it offers operators yet another option in this flexible family of solutions. If you’re seeking an alternative to replacing steel pipeline or a rehabilitation process that’s proven to work, click the button below to get started.